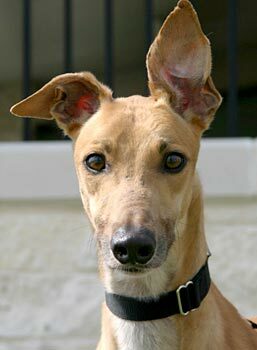 Shaq, aka Team Sugar Shack, is handsome, 3½-year-old fawn male born May 24, 2006. 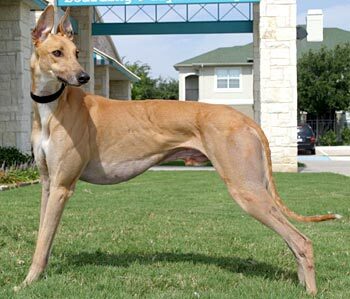 His sire is Teamster, making his grand sire the late famous Molotov, and his dam is GLB’s Sugar Plum, making his grand sire the late famous Gable Dodge. His racing career of 32 races started July 7, 2008, at Ebro in Florida, moving on to Flager where he retired on June 19, 2009. 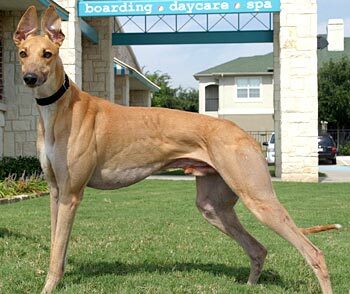 Shaq sports both of his grand sire trademarks – Molotov’s white tuxedo blaze and Gable Dodge’s fawn color. Shaq is not small animal or cat tolerant. After my lackluster Florida racing career came to an end I found myself at GALT. Up to this point in my life I had never learned any manners. I ate my meals as fast as I could. I pulled and lunged on my leash. Anything I considered valuable was mine for the taking. I am big, confident and strong. I have a high prey drive. These qualities allowed me to push and bully my way to get anything I wanted. 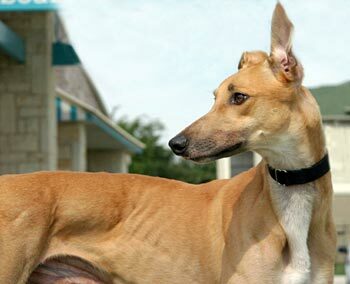 These qualities also made it difficult for GALT to find a foster home for me. After two months of training my best friend said she wanted to become my foster mom so she could teach me even more. Since my foster mom has four greys, one tabby cat, and a husband, I would have to stay in the husband’s office. Well I love my crate and my warm soft bed. The other dogs seem nice. (I especially like the sweet docile Irish girl!) I love going for walks with my new pack. I have never raised my leg in my foster home. My foster mom gives me daily medication because I have a thyroid imbalance. She says it's something I'll need to take for the rest of my life. In my foster home there are new rules. “Nothing in Life is Free.” Mom and dad make me earn everything! Every bite of food, every toy, every privilege, every show of affection must be earned. We are also working with a professional trainer. I am learning even greater impulse control. My foster mom says that I am the most loyal dog she has ever met. She says I would do best in a home where obedience training is incorporated into every aspect of my daily routine. She also says I am a smart boy who needs an experienced dog handler. I need someone who is willing to set good guidelines and rules. They must be willing to enforce those rules. I would do best in a home without small animals or children. While I wait for my forever home I am going to continue my training. I never knew that being a good dog could be such greyt fun!! !